I am going to rule out the first point out of hand, because my observation of OSR people is that even if they are old, they are hardly technophobes! Witness the recent coordinated mass-migration to MeWe – sure we haven’t worked out everything yet, but people have generally embraced the task of learning something new. The second point – about OSR players preferring “theatre of the mind”, could well explain things. That’s probably a topic worthy of its own blog post because the use of miniatures in the original D&D seems overlooked in some OSR circles, in a reaction against the perceived over-reliance on them in modern versions of the game. The miniatures topic was well discussed on Grognardia a long time ago (http://grognardia.blogspot.com/2010/04/miniatures-are-old-school.html) so I won’t presume to do it here. I do think that keeping the focus on the faces of other players rather than on a screen-sized battle mat plays a role in the preference for tools like Hangouts over Roll20, but I think this is only part of the explanation again. I think the biggest contributor is that Roll20 and Fantasy Grounds do not support OSR rulesets very well, at least by comparison to their support for 5e and Pathfinder. As a consequence, OSR VTT games are high-prep games. Pre-made characters sheets are available for many popular OSR games, but there aren’t pre-made modules ready for purchase and deployment, nor compendiums, not built-in scripts etc as are available for 5e and Pathfinder. Castles & Crusades has pretty good support on Fantasy Grounds with a huge range of modules and support products available for purchase, but even popular OSR games like Lamentations of the Flame Princess and Swords & Wizardry do not. Mapping! 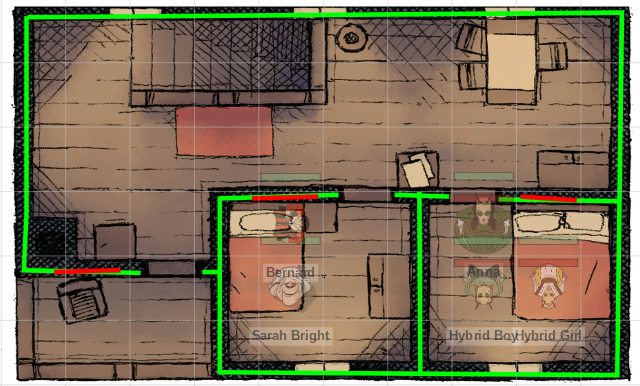 Rather than describe the dungeon and have players keep their own maps, I can have the dungeon unfold visually in front of the players, effectively “drawing” the map on their screen. 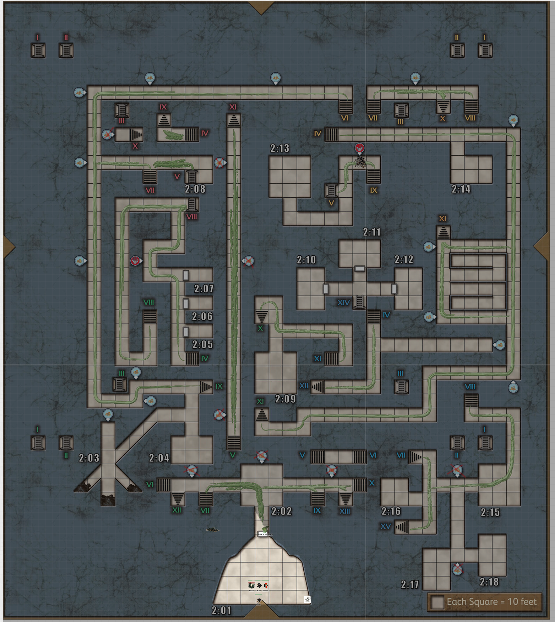 With Roll20’s Pro features (dynamic lighting and advanced fog of war), this map can be unique for each player, and reflect only the features of the dungeon which have actually appeared in the player character’s line of sight. OK, I grant, this is not really mapping, true old school style, but truth be told my players do not generally make their own maps (either face to face or online), but this automatic mapping overcomes the “player laziness factor”. The examples below are from my Roll20 Lamentations of the Flame Princess campaign – from the excellent James Raggi module “The God that Crawls“. If you’ve played this module, I think you’ll agree it benefits from mapping. Referee Map – zoomed all the way out. Player’s view of the same map. Illuminated area at the bottom shows what the players can see now. Explored areas are visible via advanced fog of war. 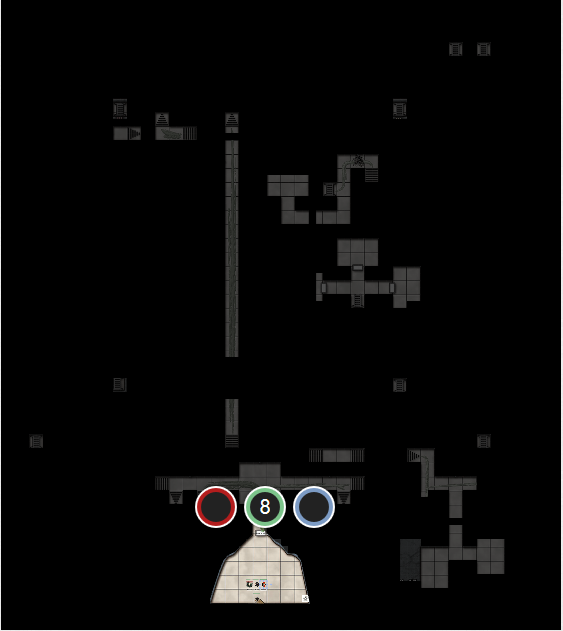 Note that players cannot see the referee moving things about in previously explored areas – only the illuminated ones within the current line of sight. 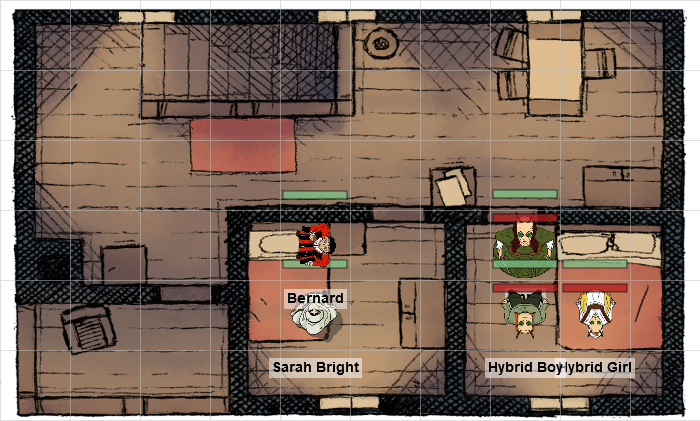 Referee’s view of a house, showing the player character (Bernard) in the middle, an NPC in the same room as him, and an alien hybrid family in another room. Player Character (Bernard)’s view of the same area. He can see everything in the room and can see beyond through the open doorway. Note that Bernard never explored the bottom right of the map, so these appear as black on his screen, as opposed to merely being in shadow. Something else you may notice from these “zoomed in” pictures – the beautiful custom tokens made especially for my Lamentations of the Flame Princess campaign by the very talented Peter Saga. Peter is also very easy to work with if you are thinking of commissioning similar tokens for your game, by the way: https://www.artstation.com/petersaga_1 These tokens effectively take the place of miniatures, which many people (certainly my players) find both visually exciting and engaging – can’t do that in Discord. To really get the most of the visual advantages of virtual table top, you need to do quite a bit of prep. First, you need to find/make token-scale maps (effectively battle mats) for more important locations in your game. You can also incorporate regional and kingdom maps, although these can be in any scale they come as precise location of individual player characters tends to matter less. Then, you need to load the maps into your virtual tabletop. To take advantage of the Pro features in Roll20 which enabled the effects above, you need to both pay for a Pro subscription and to draw your dungeon’s walls again in Roll20 to allow dynamic lighting to work its magic. To do this, you need to jump to another layer, and then draw in the map lines, preferably in bright lines so they stand out (don’t worry, you won’t see them in play). When a player character opens a door, you need to jump back to the dynamic lighting layer to remove the line through the door, then jump back. It’s time consuming for large dungeons like The God that Crawls. 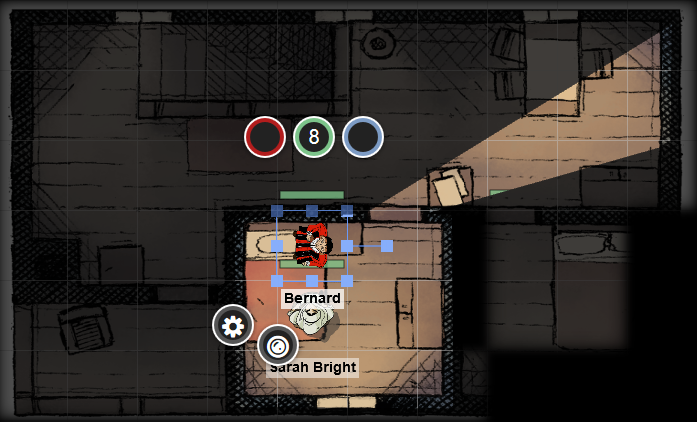 The same map’s dynamic lighting layer in Roll20. Note that doors were drawn in red, walls in green. Doors were “moved aside” when they were opened in the game (hence Bernard can see through the open door in the previous screenshot). Now, I have to make a referee confession at this point. I have never been good at consistently preparing for game sessions, especially in the preparation of maps. And yet, despite becoming adept at flying by the seat of my pants, preparation does make me a genuinely better referee. It means I save my improvisation skills for where it is really needed and that the game world is much more consistent. Playing a VTT campaign forces me to prepare lots of maps before playing – maps that cover everywhere I think the players might go. Preparing these maps also means I stock locations in my sandbox as I go. Dare I say, players also have more agency because I am not “forcing” any scraps of ideas I have on them – they choose where to go and what things to get killed by, not me. So, at least for me, VTT games are high prep games, but that’s not a bad thing. I often use the “table” in roll20 like a core handout, with images and drawings and stuff on it. I find the highest prep is often in creating a lot of handouts – which I do to make the rules clearer for players. If there’s a rule that we stumble on or is fiddly, I will make a handout so I can click “Show to Players” when it comes up. The hand-outs feature is handy, but not quite as flexible as I’d like. I’d like to be able to attach multi-page PDFs for example.